When I was an aspiring young writer — at about age 10 — I decided that I was going to write my first novel and set it in Sierra Leone. I spun my metal globe and that’s where my finger landed. Besides, it was a cool name for a country. I still haven’t written that novel, nor been to Sierra Leone, though I have read memoirs about Ivory Coast and Liberia. 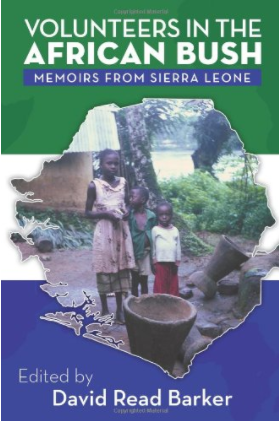 That distant memory made me smile when I had a chance to read Volunteers in the African Bush: Memoirs from Sierra Leone. The book’s editor, David Read Barker, had a lingering question in his head. He wondered if he and his fellow Peace Corps Volunteers from his training group, as “agents of change,” had in any way contributed to the uprising and subsequent vicious civil war that ravaged Sierra Leone from 1991 to 2002, even though the American idealists preceded the conflict by a quarter century. Did anyone see it coming? The fact that 45 years had passed didn’t stop Barker from trying to track down his former mates to see what they thought. Most had lost touch entirely, but through the wonders of the Internet he found 53 of the 76 in their group and convinced 25 of these retirees and grandparents to reflect on their experiences and contribute individual essays (21 in all, some are double-bylined) to this collective memoir. Barker and his ex-wife, who were one of several married couples in the group, both have essays in the book. This was the third group of PCVs to arrive in Sierra Leone. Most were fresh out of college and had been inspired by the President Kennedy’s still new idea, and motivated further by his assassination and turmoil at home. They trained at Hampton Institute (now University), a historically black college in Virginia, and at St. Croix, U. S. Virgin Islands. They arrived in the newly independent, former British colony on the Atlantic coast of West Africa in January 1966 ready for projects in civil works, agriculture, education, nutrition and basic medical care. And they would be dispatched to rural posts — truly the “bush” in most cases, the stereotypical Peace Corps “mud hut” existence in an extreme climate prone to blistering heat and thrashing rain storms. I thought of my own PCV service, which I did mid-career in my late 30s just 10 years ago, living in a big city in Eastern Europe, a long time after this group toiled in Sierra Leone. We had our own ex-Communist mental kung fu and corruption to deal with, but our living conditions were generally fine. Would there be any similarities? Indeed, there were many parallels. Ah, training — the early camaraderie and budding relationships, endless language lessons and cultural nuances, tension of not wanting to be sent home as a failure, the beer flowing at night (though I was in a dusty oil town in Romania, not on beaches in St. Croix) and second-guessing Peace Corps decisions. And later, many of the writers’ experiences with good and bad host-country counterparts and just trying to get stuff done (or not), in spite of it all, resonated with me. This seems to be a common Peace Corps refrain, no matter where. There are funny moments and good times recounted in Volunteers in the African Bush, but also horrifying ones. The book contains remarkable anecdotes in which Volunteers were nearly killed by thieves (tiefmen) and drum-beating “Leopard Society” people, evaded cobras and crocodiles, and witnessed a fatal spell of witchcraft. Some of these tales, told in graphic detail, are truly unforgettable. There are touching moments of friendship and pride of significant accomplishment — saving lives and curing kids from infections, constructing bridges and schools and delivering supplies by homemade boat to remote river villages. Some Volunteers seemed doomed to fail thanks to Peace Corps incompetence, sent to posts that were not expecting them or places where the spoken language was not what they learned in training. A few express mild bitterness for not having contributed more or quitting and going home. Others to this day regret their “ugly American” or careless moments of anger or insensitivity, for example, publicly singing over and over again The Animals’ then-hit, “We gotta get out of this place! If it’s the last thing we ever do . . ..” Still others are brutally honest about their demons during service — isolation, extreme loneliness and bouts with illnesses and nasty stomach bugs that didn’t make hole-in-the-ground latrines too fun. Several stories are better written than others, though it is evident that Barker edited carefully. The essays vary in length, some too short or too long so perhaps a consistent word count would have been preferable. A handful of the PCVs mentioned what they did later in life including a few who became professional writers and editors, such as Barker. I found this interesting and wish more had done it or at least included a short bio after each essay. The book’s two maps and glossary were useful, especially with many unfamiliar names of villages, ethnic groups and chiefdoms, and I referred to them often. This book may not go down in history as the finest piece of PCV literature, but it is an interesting and earnest memoir by a group of well-intended young people in a difficult country (witnessing the first of several coups in 1967) that later went into a notorious tailspin of tribal warfare, boy soldiers, death and decay. The lifelong impact on these PCVs is abundant. As for Barker’s open question, you’ll have to read the book to find out the answer.